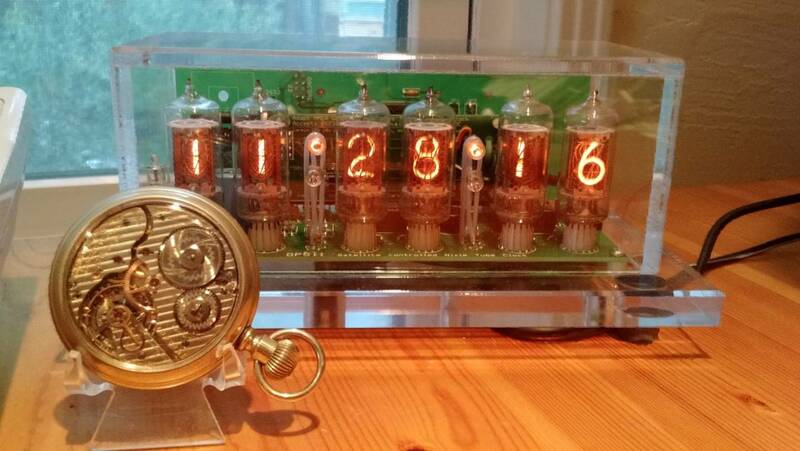 My introduction to the world of Nixie tubes and clocks was because of a Steampunk lamp I built for my daughter’s birthday seemed to lack something on it. It was no doubt an interesting lamp, and something totally out of the ordinary, but it didn't seem quite... complete. It had great big Edison bulbs, a rotary dimmer control, a Frankenstein switch, a pressure gauge, a voltmeter, copper coils and a valve that when operated switched on the two outer lamps. It needed something extra and that is when I found out about Nixie tubes. The result is the clock on the right. This was a good start, but now I had the bug. I obtained a little FunKlock kit from PV Electronics, bought some IN-12A tubes and made a Steampunk designed clock to fit to the lamp which finished it off nicely. It was that warm glow of the Nixie tubes that got me hooked on them. That was the beginning of making clocks to my own design and the clock just above on this page, the Oak Clock, was then the next case build on a PV Electronics FunKlock kit again. It is made from a stair spindle, a piece of banister and some 8 mm copper micro-bore tubing. It originally featured remotely wired IN-1 tubes as they were cheap to buy but I later found out that there is a reason why they are so cheap. One failed within months and they were replaced with CV5278 Nixies. Since that episode I have stuck to buying mainly European tubes for their reliability and longer lifespan. Remote wiring is not easy to do when you have a 6 mm bore to feed through but it makes for interesting designs. The buzz I get from making the clocks comes from designing the cases as I am not skilled enough to delve into the electronics side of circuit design and I stick to Pete Virica’s kits as they have proved reliable. The next design was using CV5278 Nixies again and I wanted a clock that would also look like a sculpture but did not realise what it would entail in the wiring department when I dreamed it up! This gave rise to what I called the Hands of Time clock. I had a nearby wood stockist who sold off cuts of hardwood and buying these saves a few pennies as you get some quite varied selections in a bundle. The elements of the clock case are poseable 12” artist’s mannequin hands, solid beech wood balls, plumbing back nuts, brass AM/PM shrouds with the wiring passing from one hand to the other. On the back there is a recessed control panel, and the clock runs with GPS time source. I like to design cases that are different from most and the next design was the most challenging that I have attempted so far. My wife and I went to Brussels, and one day while we were there, we took a trip to visit the world famous Atomium. The sight of this massive metal sculpture was inspiration for my own version of it. After a lot of head scratching and scribbling I managed to get a basic design that used the Nixie holders I had designed for my Oak Clock. I am fortunate that I have built up quite a good workshop that includes a lathe and milling machine. A rotary table was essential for this build as all the connection points for the tubing had to be exact and the recesses for the CV5278s and OG-4 Dekatron precise for visual enhancement. The design was originally without the Dekatron in the center of the clock, and only after stumbling upon them and finding a suitable Dekatron Spinner kit from ThreeNeurons (Mike Moorrees) on Ebay, was this added. This was a perfect feature for the central pod of the design. All the brass work for the structure is converted plumbing fittings, the AM/PM, Alarm/GPS LED mounts and control buttons are made from solid brass, and the LEDs are embedded in clear epoxy which is stirred until it creates air bubbles in it. This gives great diffusion of the LEDs light and their brightness is reduced by increasing the value of the limiting resistors. Rather than have the PSU and GPS sockets with nuts I designed shrouds for them with the original sockets epoxied and hot glued to the rear of the brass plate. It also has a power indicator between them. More brass was used for the pod rear covers and the underside cover to enhance the look. Nothing beats brass and wood for cases! I am fortunate that my designs have attracted some interest in that when Paul Parry featured them in his Bad Dog Designs website, a Hands of Time and an Atomium now reside in the US. Paul Parry and Pete Virica have been exceptional in their support and solving issues I have had as I progress in Nixie clock building and my thanks go to them both for that. Other clocks I have are a little wooden cased IN-12A FunKlock and a wooden shrouded IN-8 clock that will be getting a makeover into something a little more enhanced with brass. Currently I have a valve clock in build featuring a great big thyratron inside a wooden case as a centre piece in the design to be lit by LEDs using ZM1020s for the clock display. There is also a Z566M clock that will feature a lot of brass on quite a simple wood base section that has brass and acrylic RGD LED light guides on the front of it. 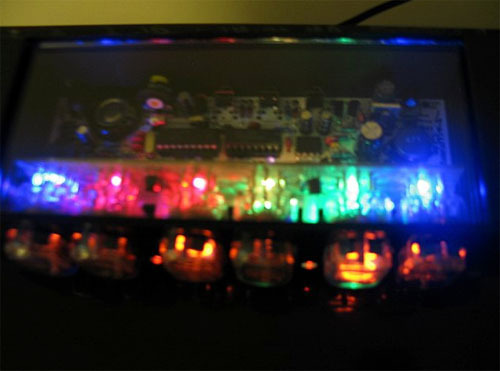 A Spectrum kit based clock called "The Peacock" is already designed and will feature lots of acrylic light guides and RGB LEDs. A working 6 cylinder engine clock with the Nixies moving up and down on the pistons made in aluminium and acrylic but need a scroll saw first! There is also my moment of total madness design, as Paul called it, in planning and if I can pull this off it will be unlike any other Nixie clock out there, but that is for the future. And finally, when funds permit it, there will be a clock based on Dalibor Farny’s excellent RZ568M Nixie tubes. 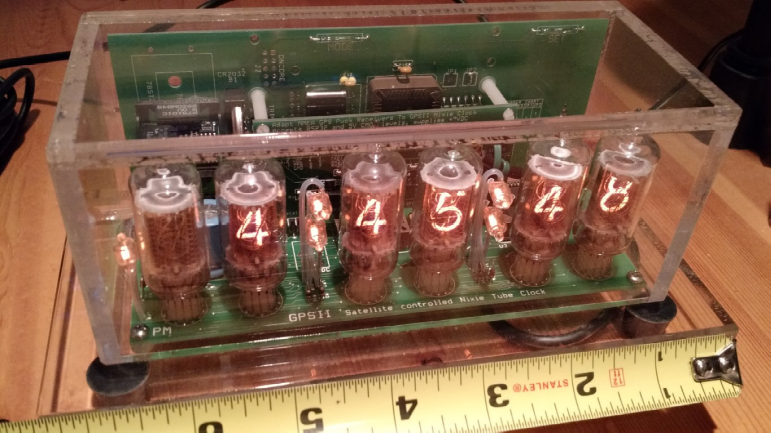 You just have to love Nixie tubes! 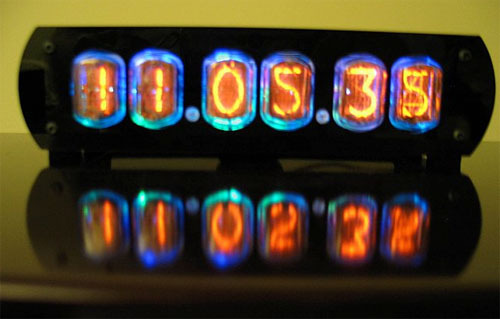 Many people in the Nixie Clock Community have heard of Jeff Thomas. Some people even have one of his clocks. It was a Jeff Thomas clock which caused Brian Stuckey to start this site. Jeff was renowned for the quality of workmanship and the attention to detail, and the clocks were good, reliable and full of features. Should he sell it? (Can't help on the one, sorry). Is there a legal problem because of the potentially lethal nature of Nixie clocks? (Maybe, but people who come to a site like this should know about this sort of thing already). How much should a clock like this go for? (Not sure, but they don't make them like this any more). Caution: Please be careful with the high voltages present on this clock. It has a simple Plexiglas cover as the only protection from the potentially lethal voltages required to run nixie tubes. 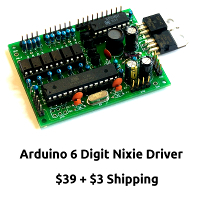 I figure folks here on the nixie site are going to be careful with these voltages where the general population on eBay may not treat the clock with the respect due. Cautions apply to only run the clock with the cover in place and to keep the clock away from children, pets and others who may put fingers where they don’t belong! Moving on to the fun part, this is a very clean 2003 example of the Jeff Thomas / John Miktuk GPS-II Compact GPS Satellite Controlled Nixie Tube Clock. The GPS-II is one of the nicest looking small GPS controlled clocks – at least to my eye. These Jeff Thomas / John Miktuk clocks are also relatively rare and are a part of Nixie clock history. 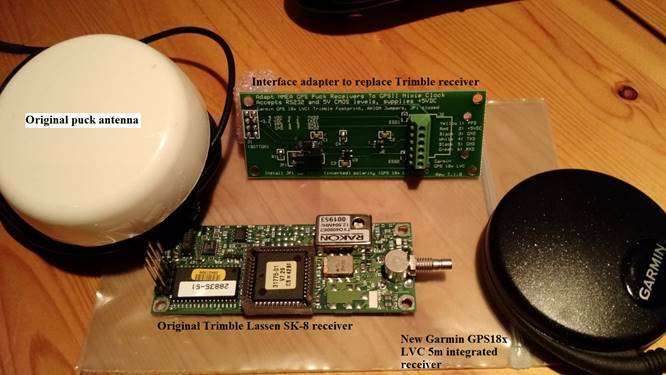 I upgraded the processor with the most recent 2010 firmware from John Miktuk a few years back and recently replaced the original Trimble Lassen SK-8 GPS receiver to work around a problem that developed with all Lassen receivers of this vintage – more details on the receiver below. Menu items are permanently stored in EEPROM. 12 or 24 hours display. Programmable display disable at night. PM indicator for 12 hour display. Digital Temperature sensor with quarter degree resolution. Leading zero blanking in 12hr display mode. My GPS-II as originally supplied by Jeff came with a Trimble Lassen SK-8 GPS receiver and all was fine and good until February 13, 2016. On that date, the Trimble Lassen firmware created a date decoding error and the clock began to display the year as 1996. Not good. Here is one manufacturer’s description of the problem and their provision of revised application firmware to address the issue. The manufacturer above was able to modify their firmware to fix the problem. Unfortunately, the GPS-II clock firmware is not public domain and is not available for me to fix the bug. I took an alternate approach adapting the GPS-II hardware to use a Garmin GPS18x LVC 5m integrated receiver. The core of my modification is a printed circuit interface board that I designed and built to be a mechanical match to the original Trimble Lassen receiver. I changed out the GPS receiver board in the clock for my adapter, changed a jumper on the GPS-II to tell it to process NMEA sentences as provided by the Garmin receiver and the clock was back to displaying the correct date… with a more modern and more sensitive GPS receiver. As an aside, my adapter will support many 5V integrated receivers at both CMOS and true RS-232 levels. There’s also a jumper supplying an optional logic level inversion. A point of pride… Jeff built beautiful clocks with meticulous workmanship throughout. It was my intent to match the quality of Jeff’s work with my surface mount adapter card. I like to think that I succeeded.